Mind mapping is a popular technique that can be applied in a variety of situations and settings. Students can make sense of complex topics and structure their revision with mind mapping; business people can manage projects and collaborate with colleagues using mind maps, and any creative process can be supported by using a mind map to explore ideas and build upon them. Mind maps allow for greater creativity when recording ideas and information whatever the topic, and enable the note-taker to associate words with visual representations. 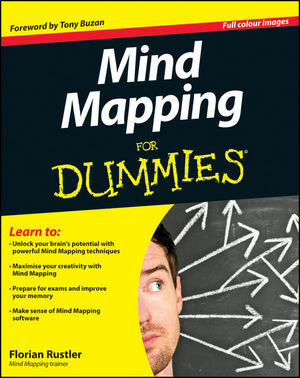 Mind Mapping For Dummies explains how mind mapping works, why it's so successful, and the many ways it can be used. It takes you through the wide range of approaches to mind mapping, looks at the available mind mapping software options, and investigates advanced mind mapping techniques for a range of purposes, including studying for exams, improving memory, project management, and maximizing creativity. If you're a student, artist, writer, or businessperson, Mind Mapping For Dummies shows you how to unlock your brain's potential. Florian Rustler is a licensed Mind Mapping trainer based in Munich, who trained with Tony Buzan. Within the last six years he has given more than 300 Mind Mapping seminars. Some of the organisations he has worked with include Bosch, MTU, Siemens and Volkswagen as well as various trade chambers and universities.